Hi, I’m Pamela J. Oakes, owner of The Profitable Nonprofit, a global business development company for purpose-driven, mission-minded, socially-innovative do-gooders, dedicated to changing the world! My mission is to ensure that those who want to change the world for good have the funding and resources to do so! As a Consultant, Speaker, Business Mentor, Trainer and Coach, I teach burgeoning nonprofit and social enterprises how to achieve funding sustainability so that instead of expending all their time and energy chasing down nickels and dimes, they can finally stop begging and get funded! I am a true northwest native, born and raised in Seattle, Washington. This means I love hiking, biking, swimming, camping, walking, and just about any other “-ing” as long as I can be outside doing it! I am the second child and first girl sandwiched between two brothers with a sister bringing up the rear. I still chuckle to think that “definitely has her own mind” is a statement my mother wrote in a scrapbook to describe me…at age 2! Strong-willed, dogged-persistence, unwavering commitment…I guess I was always destined to be a future Lady-Boss! My father owned his own real estate company, my paternal grandmother ran her own beauty parlor, my maternal grandfather & grandmother owned a restaurant, and my great-great grandfather had his own practice as a country doctor. You could say that I come by entrepreneurship naturally – it’s just in my blood! I started my professional career in my father’s real estate company – flipping properties before “flipping” was even a thing! When the news magazine, US News and World Report wanted to feature me in article, I thought for sure I had finally hit my stride. But despite the accomplishment, there was still a longing that commercial success didn’t quite satisfy. I have always been a firm believer in paying it forward especially when it comes to empowering women and children from disadvantaged populations or developing countries. 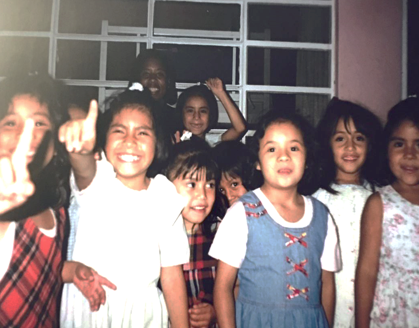 In the late 90’s, I had the opportunity to participate in a humanitarian mission in Mexico. After volunteering in a children’s home, I was forever changed and I knew my life would somehow be defined by service to others. It seems that once you are clear in which direction your path leads, it’s easier to see which actions and decisions draw you closer to or farther from that path. My path was leading me to Africa. For several years I worked consulting with the top 100 companies in South Africa. With my base in Johannesburg, I travelled extensively throughout the southern African countries conducting workshops and training seminars for government, corporate, faith-based and community agencies in the areas of Diversity, Affirmative Action, Employment Equity, Gender Equity, and Personal and Organizational Transformation. Incredibly, I had the honor of shaking hands with Nelson Mandela and was even invited to a private audience with her royal highness, Queen LaMbikiza of Swaziland! Once you know your purpose, all the resources, connections and relationships you need to fulfill it will be made available on that path. My free-time in Africa was often spent in rural townships and villages supporting local NGO’s and establishing and supporting self-empowerment initiatives. 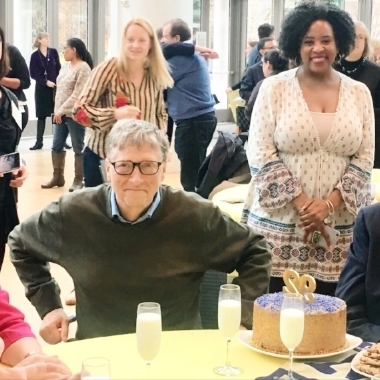 It was actually during this time that I became better acquainted with the global work of the Bill & Melinda Gates Foundation. When I moved back home to America I knew exactly where it was I had to work! I’ve been a business owner, mentor and passionate community volunteer for years and remain a spirited advocate for global issues of women and girls. However, having spent nearly 50 years nurturing a profession, I’m dedicating the next 50 to cultivating my passion. I’m busting into my toolkit loaded down with over a half-century of proven expertise and demonstrated experience in the fields of business entrepreneurship, leadership development, corporate training, professional speaking, mentoring, coaching, and project management and putting that collective wisdom to work for YOU! I first travelled to Europe the summer after high school. It was on that trip that I contracted a life-long incurable ailment known as Wanderlust! I’ve only been to 30 countries so far…but still counting! I LOVE jazz music. Smooth jazz, Latin jazz, Cuban jazz, Brazilian jazz…um…you get the picture! While in Thailand, I wrapped a 120lb boa constrictor around my neck just for the photo opp! Note to self…NEVER do that again!! I love good food. In fact, I will try just about anything at least once. My culinary exploits include crocodile, ostrich, warthog, zebra, mopane worms and jumping shrimp salad made with live shrimp…of course! My favorite pastimes are scouring antique malls and collecting African-American art. If you ever see a car with a bumper sticker that says, “I brake for flea markets,” look close, it might be me! I always wanted to be multi-lingual and still plan to learn Italian one of these days. I studied French in high school and college but lost much of it from lack of use! Nowadays, I only know just enough French to be dangerous! I am a book person – no Kindle for me! – I love the smell and the feel of a REAL book. I can re-read the classics over and over. Despite my many moves, I have been carting around a beloved collection of leather-bound classic volumes for nearly 30 years! I am passionate about empowering the powerless and giving voice to the voiceless. Nonprofit, charitable, humanitarian work is not just what I do, it is who I am and what sets my soul on fire! Pamela J. Oakes is a Nonprofit Funding Expert and owner of The Profitable Nonprofit. Prior to launching a full-time business, Pamela worked 8 years as an Associate Program Officer, Strategic Planning and Engagement for the Bill & Melinda Gates Foundation, U.S. Programs team. This team’s vision is a Pre-K to postsecondary education system, that enables all students to develop the knowledge, skills, and agency needed to thrive as adults and contribute to their communities. Before joining the foundation in 2010, Pamela lived several years in Johannesburg, South Africa working for and promoting humanitarian efforts with the I CAN Foundation. As a Trainer with this NGO, she traveled extensively throughout the African countries of South Africa, Botswana, Swaziland, Nigeria and Zimbabwe conducting workshops and training seminars for government, corporate, community, and faith-based organizations in the areas of Employment & Gender Equity, Diversity, Affirmative Action, Change Management, Organizational Transformation, HIV/AIDS Awareness, and Personal Empowerment. A spirited advocate for the underserved, Pamela is passionate about coaching and mentoring small nonprofits and social entrepreneurial enterprises with the goal of ensuring that those who want to change the world for good, have the funding and resources to do so. In her spare time, she volunteers with local initiatives such as the YWCA Housing Stability Program, the Kent Regional Justice Center and participates as a mentor for the YWCA GirlsFirst Program. Pamela attended the University of Washington where she majored in Political Science. A native of Seattle, she enjoys travelling the globe, experiencing new cultures and collecting African-American art. Copyright © 2019 The Profitable Nonprofit. All Rights Reserved. Website designed by Jeanne Verger Designs.